6.82 points at 22 votes (rank 400). They got us! These horrendous and treacherous parasites have infiltrated one of our outer colonies. All the inhabitants are held ransom by these disgusting aliens. They are slimy, poisonous and almost indestructible. The onyl way to get rid of them is a detonation. But this would cost hundres of lives. You are armed with just a simple weapon, but there are hidden weapons that are much more effective. Get them! All hostages need the get free. At the end of each level waits one of these super aliens. Find his weak point! We have placed a time bomb in the colony, because we need to avoid that this horrible virus spreads any further. Free the hostages. Now! Before the explosion puts an end to this (and to all people involved). 2D graphics which can be scrolled in all directions. A small map is built in. This is activated by wall switches and shows the drawing of the station and the location of the inhabitants. Sound and music fit the game. 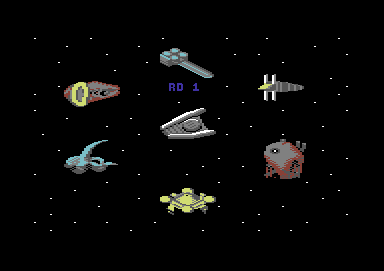 The partially very many sprites in the shape of hostile aliens move quickly and seem very realistic. 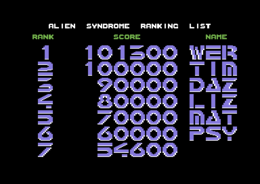 It is possible to save the highscore list on disk when you habe 40.000 points or more. FB Fireball This highly modern weapon shoots great rolling fireballs. L Laser This effective weapon can eliminate a group of aliens with one shot. F Flame thrower Constantly sprays a fire blast. But only with a low reach! B Bomb Is helpful against some of the super aliens. Look into all directions, shoot right away at the Aliens, avoid their shots and try to get a better weapon from one of the closets. Touch the MAP icon and you will be shown the hostages still to be freed on a small map. Touch the ? aymbol and you will get bonus points. When all hostages were freed, the current sector can be left through the exit gate. So a fast approach is needed. If the time runs out, the game is over! 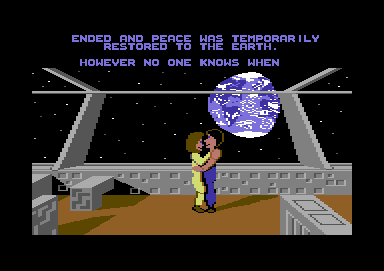 You should not use continous fire, but defeat the aliens with one well-directed shot. The people should be freed on a path-optimized order (work through from bottom to top) to save time. At the beginning there is need for a better weapon (laser or fireball) to enlarge the reach of shot. When you have collected all 16 people, just use the exit in the upper area. Shoot into the red opening of the end boss and avoid the attacking green aliens. Before the yellow alien snaps, dodge upwards or downwards and shoot vertically at the alien. Sledgie: "A very quick action game which needs a high reaction capacity. I personally think it is too difficult. To know the promise of all levels I played in the trainer mode. As a buff of the film, the game gets 7 out of 10 points from me." TheKills: "A real neural killer was created here... not due to the tension but due to frustration. In fact I never made games like Frankie goes to Hollywood or Impossible Mission, but you were never so agitated after playing them." Werner: "Clean scrolling into 8 directions. The sound is also successful. But right from the start the game has a very high difficulty grade. 8 points." 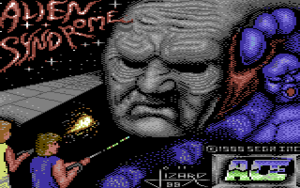 Originally, Alien Syndrome was issued on the Amiga and was later converted to this version on the C64. 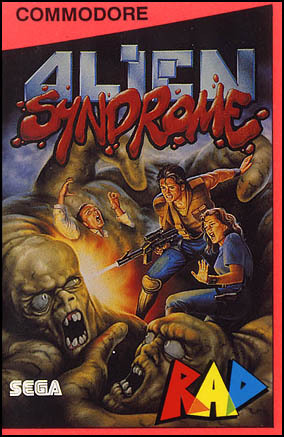 Alien Syndrome in the Killer List Of Videogames. This page was last modified on 20 July 2017, at 12:35.